Invisible braces have become the popular choice for orthodontic treatment at Ritchie Dental Group. Straight teeth are not only beautiful teeth, but they actually contribute to your oral health as well. If you want to maintain your mature, professional image while undergoing orthodontic therapy, consider Invisalign clear braces. With clear plastic aligners designed with 3D technology, Invisalign clear braces offer a custom treatment plan for your unique smile. 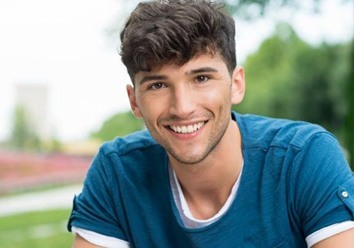 When you visit our Marble Falls or Brady, Texas dental office for an Invisalign consultation, we’ll discuss clear braces treatment with you to help you understand exactly how the process works. Since aligners do not use any metal hardware, they are significantly more comfortable overall. There’s no worry of allergic reaction if you have an allergy to metal dental hardware and a lower chance of a dental emergency. Broken or exposed brackets and wires can easily cause damage to neighboring gum tissue and enamel, but clear aligners use FDA-approved, medical-grade plastic. While they’re durable enough to withstand daily use, they’re soft enough to feel comfortable in the mouth for several hours at a time. Metal braces force patients to change their brushing habits to prevent plaque buildup and staining once the braces come off. They’re also far more prone to collecting food debris, therefore increasing the risk of tooth decay and gum disease. In contrast, oral hygiene is much easier to manage while undergoing Invisalign treatment because they’re removable. Simply take them off whenever eating or brushing and replace them when you’re done; no need to relearn your brushing technique or change your diet. Finally, clear aligners are simply more attractive than metal braces, which may be a must if you’re an adult with an already established image at your workplace. If a special occasion comes up and you want to ensure your smile is fully exposed, removing them for a picture or two is simple and straightforward. After Dr. Mendy Ritchie has signed off on your Invisalign treatment plan and the aligners arrive, you can begin wearing them right away! As you go through your series, it’s important that you stay consistent with their use and wear them for as long as possible, only removing to eat, drink fluids other than water, or practice oral care. For the most effective results and shortest treatment time, patients should be wearing them for a minimum of 20 to 22 hours per day. You’ll be able to practice your regular activities without interruption. 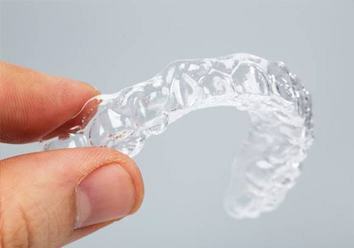 Invisalign works by applying gentle pressure to your teeth and permanently changing not just their position, but the underlying connective structures holding them in place. Without changing the foundation teeth rely on, you can’t shift teeth at all. Dr. Ritchie will also have you come in every four to six weeks to ensure that your teeth are shifting as planned. She’ll provide recommendations to improve your treatment or make adjustments as needed to make sure that you stay on schedule. A lot of adults opt for Invisalign because the aligners are invisible. When Invisalign first came on the scene in the late 1990s, this was a revolutionary development for adult orthodontics. Invisalign makes invisible braces for teens now as well, making it easy for your teenager to feel more comfortable about his or her appearance while getting the orthodontic attention they need. Fortunately, the cost of clear aligners is largely comparable to traditional braces. That means you don’t need to spend significantly more just to gain the convenience Invisalign offers. 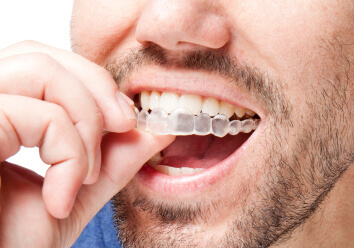 The price can fluctuate based on the complexity of your case and how often you actually wear the aligners for, however treatment can average anywhere from $3,500 to $7,000 per series. During your consultation, you’ll get the chance to learn more about what needs to be done before you start. Keep in mind that you won’t be paying as much for routine visits which are necessary for traditional metal braces. Plus, you’ll need to wear braces for much longer on average than clear aligners, so more visits will be needed by default. Dr. Mendy Ritchie offers complete traditional orthodontics at our Marble Falls and Brady, Texas dental offices as well. Should you need more traditional treatment than what is provided by Invisalign clear braces, we can deliver. Just remember, though – most adults are capable of being treated with Invisalign at Ritchie Dental Group.